Knowledge of the involvement of the Federal Republic of Germany (FRG) and the German Democratic Republic (GDR) in events on the African continent after 1945 is limited. The empirical base of the current state of research looks like a patchwork rug – with more holes than cloth. Only a handful of African states have actually been the subject of a case study on this issue and most of these works, if not all, have focused on German diplomacy. Usually Africa ‘policy’ is how this focus is referred to and it is dominated by one thesis. It covers the dominant role of the ‘Hallstein doctrine’ and the West German – East German contradiction in German foreign policies of the 1950s, 1960s and early 1970s but it neglects the roles of other–interests in German foreign policies, especially economic and geostrategic. In this blogpost for roape.net I am calling this thesis, as well as the whole discourse on German foreign policies/diplomacies, into question. In 1949 two German states appeared on the world scene. The Federal Republic of Germany, bound to the West, and the German Democratic Republic, bound to the East. As both of its governments claimed to speak for the German people and the German nation, a ‘German-German’ contradiction arose, most notably manifesting itself in their domestic and cultural policies and public diplomacies. In 1955 a West German government delegation travelled to Moscow to restore diplomatic relations. As the West German government feared a similar approach by the GDR, Secretary of State Walter Hallstein declared the establishment of the ‘Hallstein doctrine’. The doctrine stated that recognizing the existence of the GDR and establishing diplomatic relations with it would be seen as an unfriendly act by the FRG, leading to negative consequences for foreign states. It was replaced by the more moderate ‘Scheel doctrine’ in 1969 and finally abrogated in 1973 when the German-German Basic Treaty became law. East Germany established a congenial doctrine in 1967 as well – the ‘Ulbricht doctrine’ – after West Germany’s new eastern policy had led to diplomatic relations with Romania. But be that as it may, in the end, it is the Hallstein doctrine that remains in Germany’s cultural memory. In both German states politicians used the doctrine to gain political ground. West German politicians utilised it as an official reason why it was necessary to maintain an embassy in nearly every state of the world and East German politicians used it as an explanation that they could present to the East German public and the world why it wasn’t diplomatically present everywhere, namely the hostile attitude of the respective other German state. In the West and in the East historians and political scientists established the doctrine as the main thesis on contemporary German foreign policies. The Hallstein doctrine became the catchphrase of every study on German foreign relations between 1945 and 1972 – in several cases even lasting until 1989. The possibility of the existence of any other interests were never really pursued. This is quite curious. After World War Two both German states developed quite well – in the context of their respective camps. West Germany went through the famous Wirtschaftswunder, its ‘economic miracle’, and East Germany – even though it never narrowed the gap on its capitalist brother state – also experienced strong economic development. However, no one ever connected the dots and tried to analyse the German countries’ foreign policies in context of their trade and economic policies. This is what I have tried to do. Yet a glimpse on the German involvement in the Congo crisis shows that national economic and international geostrategic interests dominated German activities. In July 1960, just days after Belgium Congo had become the Republic of Congo (Congo-Léopoldville), the crisis began. Already in the early spring of 1960, Congolese political parties had split up into two different camps. The regionalists, who wanted to decentralize power as they were only strong in their heartlands, and the nationalists, who wanted to centralize power as they had voters in each province of the country. As a result of the first national elections, Patrice Lumumba, leader of the centralistic Mouvement National Congolaise (MNC), became Prime Minister and formed a central government. Joseph Kasavubu, leader of the ethnic Association des Bakongo pour l’Unification, l’expansion et de la Défense de la Langue Kikongo (ABAKO) became President. In July 1960 the conflict erupted, catalysed by Belgium, several other Western states and international companies which tried to use the conflict to pursue their own economic and geo-strategic interests. On July 5, the Congolese army mutinied when their Belgian officers told them that, even though independent, everything would stay the same in the Congo. Lumumba calmed the situation but on July 11 the state of Katanga proclaimed its independence and in August South-Kasai also broke away. The Congolese army intervened, leading to an actual clash between the regional forces and the central authority. Soon the Congolese government in Léopoldville was affected as well. Kasavubu started to disapprove of Lumumba’s policies openly. The conflict ended with a coup led by Colonel Joseph Mobutu in September. The elected government was annulled and Lumumba as well as several of his party colleagues were arrested. In January 1961, after Lumumba and his comrades attempted to flee the capital, he and two of his colleagues were shot in Katanga by Belgian forces working with the breakaway government in Katanga. In the meanwhile, many of his supporters and former cabinet members had flown to the heartland of the Mouvement National Congolaise-Lumumba (MNC-L) in the North East of the country. They organised themselves in the region’s capital Stanleyville, where they proclaimed a second Congolese state. It existed until autumn 1961, when the governments of Léopoldville and Stanleyville reached an agreement to reunite. But the Lumumbists had been tricked. In the following months they were persecuted and faced reprisals. Many went underground or flew into the neighbouring Republic of Congo (Congo-Brazzaville) where they established a rebel movement. In 1964, they started a second uprising in and around Stanleyville and were able to conquer half the country. In the meantime, the ‘independent state’ of Katanga was able to raise enough mercenaries to build up an effective army which was able to offer resistance against the army of the Congo until 1963. Only the intervention of the United Nations forced Katanga’s reunification with the Congo. South Kasai was easier to handle. It was already reunited with the Congo in 1962. To summarize the Congo Crisis was both an international conflict of constitutional, political, and economic power, and an external conflict of decolonization, the Cold War, and foreign economic interests – the latter being something that the two German states had a lively interest in. In February 1960, when the famous conference Table ronde belgo-congolaise in Brussels – on which the decolonization of Belgium Congo was discussed – ended, Lumumba and two comrades, were invited to the FRG. In exchange for a written concession to keep the MNC on a pro-western course, support was promised and several offices for the MNC in West Germany were suggested in order to foster German-Congolese economic relations. In the meantime, in the GDR, Antoine Gizenga, who in July 1960 would become Lumumba’s Vice Prime Minister, had already crossed the German-German border in Berlin in December 1959 to ask the East German government for support and the opportunity to open a Congolese exile government in its capital in case the Table ronde should fail. Even though some in East Berlin saw the country’s independence as another step towards world revolution, it was the Congo’s richness of minerals which became a major issue widely discussed by East Germany’s leadership. In July 1960, just some days after the Congo had become independent, West Germany switched sides and started to support the anti-Lumumbist movement. Lumumba had given his first official dinner for the West German ambassador and some of his closest German friends, followed by a press conference solely for West German journalists. During these events he and Gizenga had presented their plans for the future: to centralize the government, regional governments should be shut down and replaced by so-called governors, selected by Lumumba himself. As a centralized state was not in the interest of the West and West Germany, the opposition party ABAKO became West Germany’s new favourite. It stood for a strong regionalism and a continuation of the country’s federal constitution. Lumumba and the MNC were its intractable opponents. The FRG supported the opposition by indirectly financing credits and initializing one of its biggest covert operations in Africa. The West German intelligence agency Bundesnachrichtendienst was instructed by the chancellery to start ‘Operation Liane’. Over the next decade, about 23 million DM – respectively about 5 to 6 million U.S. dollars – were invested in the printing company Imprimerie Concordia. Financially and technically well equipped, this company soon attained a press monopoly, allowing it direct intervention into Congolese media. Its main objective was to weaken the Lumumbist movement. It had an unparalleled position, not only controlling Congolese media reports but also bribing journalists, editors and politicians as well as security and military officials. Meanwhile East Berlin continued to develop plans for an extensive East German-Congolese cooperation. It was discussed sending hundreds of East German experts to help industrialize the country, educate its population, open its markets to East German products while extracting Congolese resources for East German industry not to mention exploiting its gold and coltan mines and its diamond fields. But the Congo crisis thwarted these plans. As we have seen in September 1960 Kasavubu declared Lumumba ‘deposed’. Lumumba countered by arguing that only parliament could depose him and parliament had not. Kasavubu ordered Mobutu, to arrest Lumumba. However, Lumumba was unconfident what to do next and so his enemies finally took the initiative. Lumumba and some of his party colleagues were arrested. Representatives and delegations of the socialist camp had to leave the country. Lumumba’s remaining companions had to flee to Stanleyville taking possession of central treasury resources. With this money, they were able to bribe Congolese soldiers stationed at Stanleyville for several months. The Lumumbists became a military power. Yet, Lumumba’s arrest at the end of 1960 put a spoke in the East German wheel, though only temporarily. The East had always favoured Vice Prime Minister Antoine Gizenga and parties like the Parti Solidaire Africaine, the Parti du Peuple, the Centre de Regroupement Africain and the Alliance de Bayanzi, whose leaders already in spring 1960 had planned to found a united socialist Congolese party. They supported Gizenga when he flew to Stanleyville and founded a new Congolese Republic, declaring himself Prime Minister. The East including the GDR, started to support the new republic by sending relief supplies via Egypt and the Sudan. East Germany was even asked to print counterfeit notes and the country’s new currency, as the government’s cash funds ran short. But East Berlin asked to get paid for this act of solidarity in advance – an impossible demand for the Stanleyville government. At least East Germany – after several Congolese requests – acknowledged the new republic as a state and in August 1961 even opened an embassy in Stanleyville. Though at that time, Gizenga already had started talks with the new Prime Minister in the capital Léopoldville, Cyrille Adoula. Both governments wanted to reunite, Gizenga not least because his government had run out of money. A mutiny of his troops seemed possible. So Gizenga and Adoula signed a pact. Unity was re-established and the East German embassy had to shut down. In the meantime, West German companies were highly commercially active in the secessionist Congolese province of Katanga which had been at war with the Congolese central government since August 1960. In 1962 West German industry imported nine percent of its copper and 33 percent of its Cobalt from Katanga via Belgium. There are East German documents and Katanga press releases that even indicate that Deutsche Bank bought about 40 percent of the stocks of Katanga’s largest company, the Union Minières du Haute Katanga. These are just some examples of German activities during the Congo crisis, but they already show quite clearly that national economic and sometimes even international geo-strategic interests dominated German activities–across both states. Whereas geo-strategic interventions are sometimes hard to find, economic interests are even more often hidden – for various reasons. Studies usually base their economic information on official statistics which often only present a fragmented view of economic transactions. This applies especially to German trade. East German goods often were passed on as part of the German-German trade. They were relabelled as West German products and then went through West German ports to reach their destinations. East Germany also imported African goods via West Germany and the latter didn’t hesitate to trade with Africa via East Germany and several other European states as well. Statistics usually don’t take this transfer via third countries into account and, therefore, present a false picture of German trade – usually simply focusing on Europe. Another reason for the ‘hidden’ nature of economic interests lies in the confidential character of companies’ investments which usually form an integral part of their business models. Furthermore, investments are decreasingly made by producing companies – to stimulate real economy processes – and increasingly by banks and private investors to stow money away at a safe haven – at a secure investment opportunity – during a financial crisis. The German case is a powerful example of these processes. Between the end of the 1950s and the beginning of the 1960s a first small wave of West German investments in Central Africa can be identified. During the Wirtschaftswunder period in the FRG foreign investments flooded the West German money market as its economy seemed to become stronger and stronger. Bonn started to fear an overheating of the West German economy. The solution they found was a cash outflow towards investment projects in the ‘Third World’. In the 1970s, a second, much larger cash outflow took place as the gold parity of the U.S. dollar was cancelled. This led to a financial crisis during which dollar owners tried to win peace in European currencies. They flooded the European money markets. Europe’s answer was to channel redundant money into investment projects in the ‘Third World’ – again also towards the Central African region. The biggest one of these was the German lead multinational investment consortium Association Internationale de l’Industrialisation du Nord-Est du Zaïre with a liquidity of around two billion DM – respectively 830 million dollars. To understand these investments, where they come from and went to, gives important clues into the background of a foreign power’s engagement in the Central African region. This is especially important, if these powers described their behaviour as ‘selfless’ and ‘principled’ as was usually the case with the FRG and the GDR. The role the two German states played in the world after 1945 is still underestimated, not least owing to the Hallstein doctrine and the German-German contradiction. This prism of understanding dominates our thinking on German economic or geostrategic interests in the world after 1945. Both German states were, sometimes more, sometimes less, involved in the events of decolonization and the Cold War in Africa and the rest of the ‘Third World.’ In the Central African region, they played a role in all major conflicts; not just the Congo crisis, but in the Angolan colonial war, in the Angolan crisis, in the uprising of the Union des populations du Cameroun in Cameroon and in the Chadian fight against the Front de Libération Nationale du Tchad. To ignore this involvement leaves important parts of the puzzle of global history unsolved. It therefore can be reasonably productive to look beyond the typical powerhouses of Washington, Moscow, Peking, Paris or London. Bonn and East Berlin can also be useful in filling out the blank spaces on the map of world history. But this is only possible if historians, researchers and activists start to accept that German interests didn’t stop at German borders and that these interests were mostly of economic origin – on both sides of the Berlin wall. Torben Gülstorff is a freelance historian. In 2016 he completed his PhD in contemporary history and has worked on the history of West and East German activities in Africa after 1945. He supports the still ongoing UN investigation into the death of former UN General Secretary Dag Hammarskjöld as a researcher. 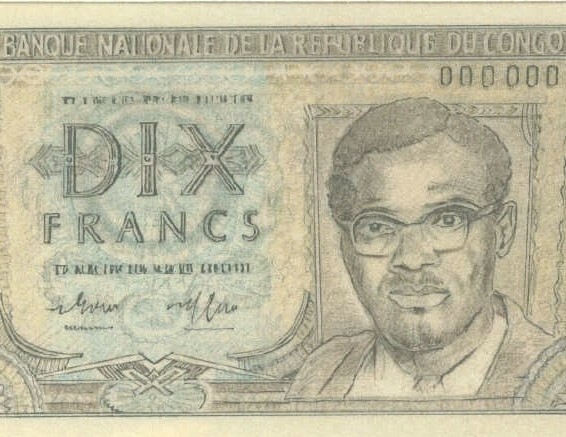 Featured Photograph: An example of a 10 francs note showing Patrice Lumumba drawn in the GDR, possibly by an employee of the Foreign Office or one of the ‘Wertpapierdruckerei Leipzig.’ (Political Archive of the Foreign Office (PA AA), section Ministry for Foreign Affairs (MfAA), A 17295, Folder 2, Fiche 2, p. 197).